Ross Byrne admits it was a bit surreal when he began his Leinster career and a major part of his role required him to order around some of Irish rugby's most decorated stars. Being a young out-half in the Leinster set-up means that Byrne is in charge of executing a game plan while also marshalling those around him - something that he counts as a real strength in his game. The 23-year-old has made over 45 appearances for Leinster since the start of the 2016/17 campaign, and has emerged as a reliable option for when Johnny Sexton is unavailable. 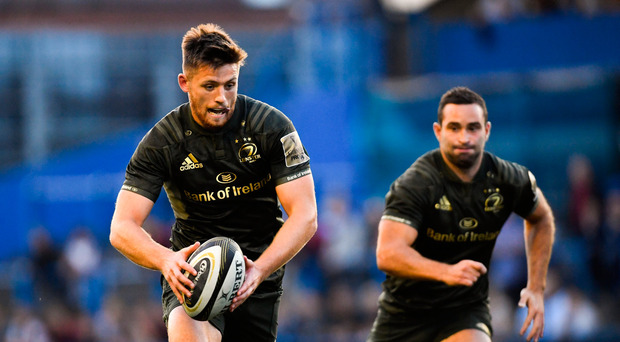 Speaking on the Left Wing with Luke Fitzgerald and Will Slattery this week, Byrne reflected on the journey he has made from untested rookie to a Leinster regular. "I remember my first start was three seasons ago and it was against the Scarlets away and it was probably the worst game I played for Leinster," Byrne said. "It seems like I've come a long way since then and I've played a hell of a lot of minutes since then. You just get more comfortable and even playing ten and bossing players around, you get more confident in yourself that you are making the right call even if someone else is saying something different." Byrne prides himself on his game management and his ability to give clear directions to his team-mates. However, he does admit that it took a bit of time to get used to ordering around players that he had been watching on TV for years. "It's something that has always been a part of my game," he said. "It doesn't take a genius to see that I'm not a great runner. Game management and bossing people around is something that I've always done so I didn't find it too difficult. I suppose it is weird at the start. I remember I was bossing around Jamie Heaslip and thinking that when I was in school I was watching him play. "But once you get on the pitch you forget about it because if you don't forget about it, you suffer and the team suffers. That has to go out the window and the lads know that. If a young lad is playing nine or ten, they just want to be told what to do. They don't want you to be second-guessing yourself."